It doesn’t cost a fortune to travel if you move slowly. 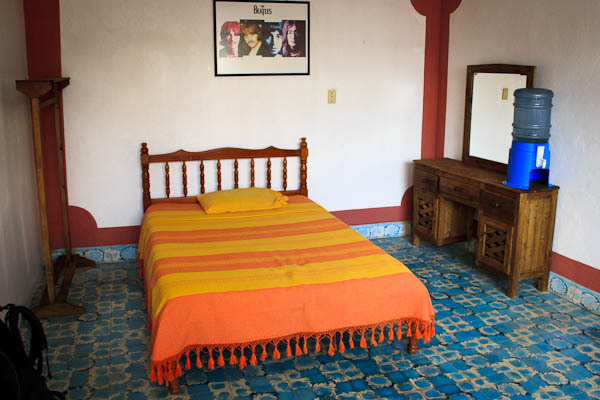 I’d only expected to spend a week or so in San Cristobal de las Casa but soon fell in love with it and decided to seek out a long-term room. An American expat I met the first night suggested I check out the bulletin board at the local supermarket. There were about a half dozen flyers for rooms for rent and the first one that caught my eye offered WIFI, paid water/power, a shared kitchen, good security, great location and a rooftop view. I would also have to share the restroom with 3 other men in the 8-room complex, but I’ve kind of gotten used to that as I’ve spent time in Mexico. I emailed the owner, Jorge, and met him two hours later. After handing him 1900 pesos ($150 US) and a 500 peso deposit, I was given the keys and welcomed aboard for the next month. 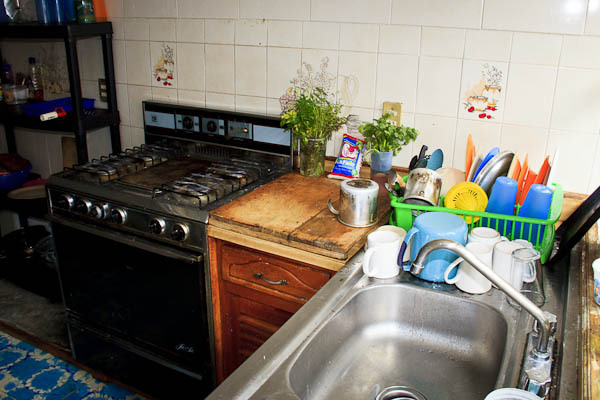 The kitchen here is large and clean and there are two refrigerators shared between the 8 rooms. I’ll admit that I haven’t made much use of it yet as I’m still gorging on all of the amazing, cheap Mexican food in the neighborhood, but I will eventually. This is my room from the outside. Again, clean and safe, though navigating down those stairs to the bathroom in the middle of the night can be a challenge. The unlimited (scalding) hot water makes it more than worth it — and no suicide showers. So how cheap can it be to live here? It depends, of course, on your eating and drinking habits but you can easily find a good meal at a local restaurant for $3 or less. If you want to splurge, an Argentinian steak will run you less than $10. Beers are about $1.50 and a glass of wine sets you back $2.50 in many places. If I watched it closely, I could easily have a good time here for $500 a month. My normal budget is $1,000 per month and I should have no trouble meeting that here without even trying. You lived a charmed, blessed life! Love it! San Cristobal is lovely — highly recommended. Now that is a deal if I’ve ever seen one! That’s a great looking place for that amount of money. Hope you enjoy your time there. That’s a great deal! Ooh, what’s the view like from the rooftop? Sweet score for $5/$150. That cost for a nice room with wifi and a desk makes the steep, middle-of-the-night stroll to the bathroom very doable. The more you can save on a room, the more you can enjoy the tapas and wine bar :) Loved that place. And, 2 peso tacos are also darn awesome in San Cristobal. Enjoy your time there! People think Mexico is expensive but I found because the rooms are cheap and street food is delicious that it was easy to stay on 1000/month. The food is making me a very happy (and fat) boy. 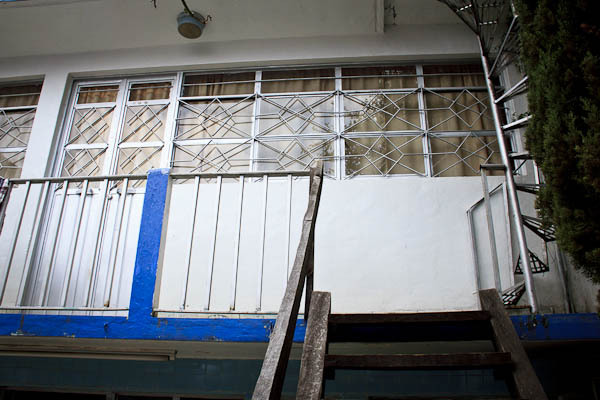 It’s strange – in Guatemala, the housing is cheap and the food fairly expensive. Here it’s the opposite. Renting per night is fairly pricy — I was paying $16 per night for a room that wasn’t as nice as this one. Monthly rental is the way to go. Yeah, Wes, absolutely; monthly is the only way I travel. I don’t mind doing hostels when I’m on backpacking treks just for shooting film or video, but on the day-to-day existence I always do long-term monthlies. But I’m also more into immersion travel rather than flitting around, so apartments suit me better than hostels because I’m usually in a location for a year or more; minimum of three months to start. I know some people who do 3-4 months in a city and just rotate hostels every 9 or 10 days so they meet all the different people within an area, but I’m just not a fan. I prefer my office space, security for my belongings…and of course the prices you can get away with on long-terms. And it’s always cheaper than hostels (just as hostels are cheaper than hotels). Doesnt look too bad – worth $5 to sleep with The Fab Four looking over me. Yep. I live in Cancun, and it’s cheap. I’ve been here a year and a half. My average per-month bill is 8,000 pesos, or around $600 USD, give or take depending on the exchange rate. That’s everything…total cost of living including entertainment, alcohol, maid service twice a month, rent, food, mota, everything. I only go above that if I’m doing a lot of things with the girlfriend, such as going out to the islands or taking a lot of buses up and down the coast for ruin exploration. My apartment is 5500 pesos per month. I have everything. Cable TV, high speed Internet, fully furnished and kitted out with dishes, bed, fridge, stove, microwave, unlimited air conditioning, sheets…the ONLY thing I needed to show up with was my laptop and clothes. You can find apartments for as low as 4500 a month further south in Tulum, and here in Cancun if you don’t mind no Internet and do your work in cafes/coffee shops. But for me, I like my home office. Mexico is super cheap….one of the reason I love having a “home” base of operations here to utilize for my explorations and immersion guides. Seeing as San Cristobal isn’t nearly as expensive as Cancun, you can easily do it for $500 a month there. Very nice seems more than decent, your close to rates in Asia by the looks of it. I did a month in January on $400 in Thailand was not easy but doable.. I loved San Cristobal, and it looks like you got a much better deal than us on a place to stay. I’m very drawn to the chopping board in the second picture – it looks well used. You have made me jealous. If I had the disposable income at the moment, I would be joining you tomorrow! Wow what a great deal! I guess it pays to stay for longer periods of time! It does, Claire: Mexicans are very big on negotiation (as is most of Latin America). As a result, you can get steals on anything as long as you speak basic Spanish and make the effort. I’ve personally found nice, middle-of-the-road, fully-equipped 1-2 bedroom places in Tulum, Cancun and Playa for 4k – 4500 pesos per month…including AC and Internet, kitchen, etc….fully furnished/kitted apartments. I’ve found them as low as 3,000 to 3,500 a month if you don’t mind an economical apartment on the low end of things. Still fully kitted out, but small, 1 bedroom place, hot water might not work all the time, might have ants, etc. If you want to share you can find things for 2k-2500 pesos per month. But yeah….the longer you are willing to sign a lease for, and the more you are willing to pay up front, the larger the discount you will get on apartments. My place in Bogota, for example, was three months…I got him down to 300 USD per month from 350 USD per month because I was willing to pay my 3 months up-front after I’d walked the area, checked out the apartment and met the neighbors. So with my deposit I pre-paid 1k in rent for a place on a 7th floor apartment in downtown Chapinero with 24/7 gated security, private maid every Thursday and all the furnishings/fixings. 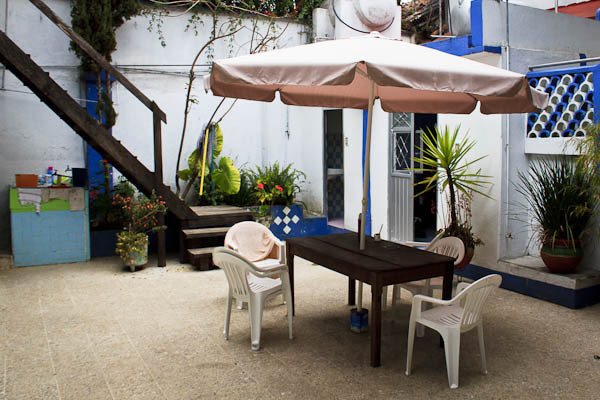 Mexico you can pretty much rest assured that you can get a nice, middle of the road place for 300-400 USD per month, fully kitted out, fully furnished, with all utilities included. Beach-front will cost you 1k-1500 USD per month. It’s a super cheap country :) And the longer you stay, the less it costs. Very interesting information here, Wes. Totally agree with you with regards to slow travel bringing costs down – especially when you find a room in a shared house which you can pay monthly for. Keep ‘em coming. Awesome, thanks for this. These kinds of nuts and bolts details show us how we can make our own trip a possibility. I literally think I’ve stayed at this place in San Cristobal! It is amazing how life get simpler, less expensive and more rewarding when you move outside of the tourist bubble. Loving this town and loving your posts! Not bad for 5 bucks! That’s what I call a steal! Unbelievable nice spot for that price! You have such unique adventures.